Have you heard of the Edmonton International Cat Festival? It’s a festival that I’m so purr-oud to have founded back in 2014, that celebrates cats, cat people, and cat culture, while raising money and awareness to support local cat rescues. 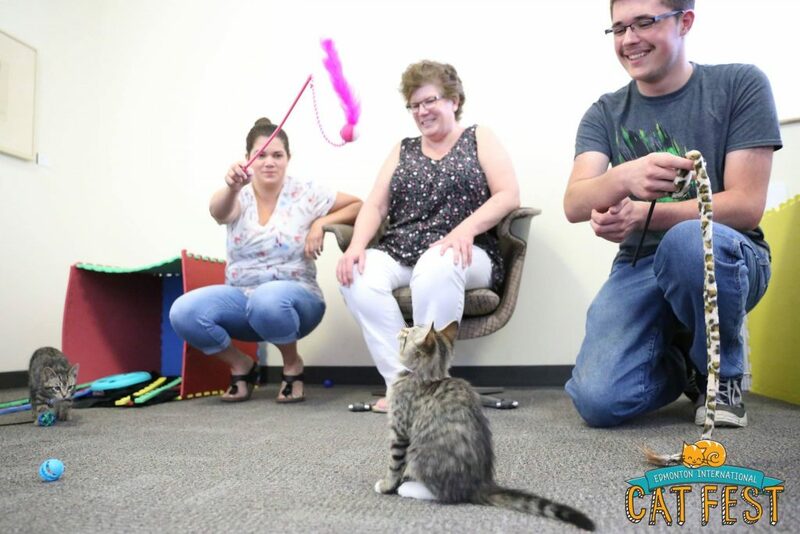 There’s everything from cat presentations, to adoptable cats, show cats, to cat board games, cat puzzles, cat yoga, cat escape rooms, vendors selling all things cats, for your cats and for cat lovers, cat clothes, cat cards, cat pins, cat toys. There’s a ton of kitten activities, cat LEGO, crafts and face painting. 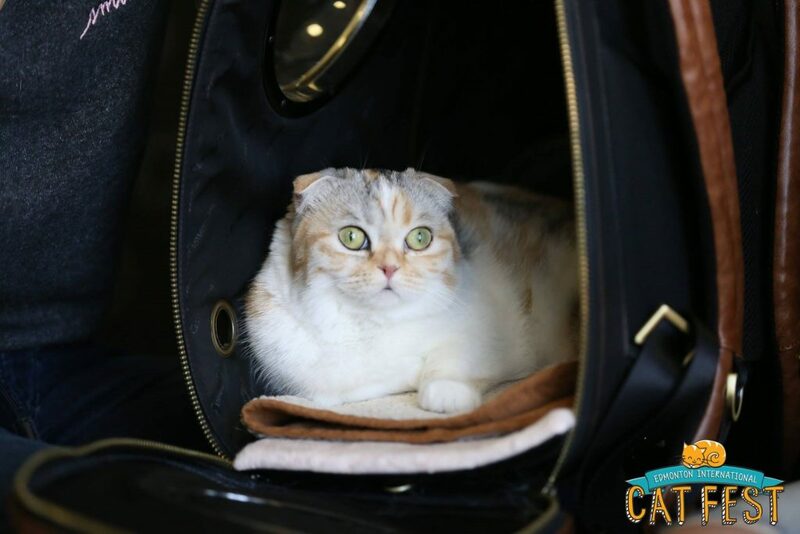 We even fly in celebrity cats to do meet and greets with attendees! A scene from the 2018 Edmonton International Cat Festival. Photo Credit: Nanc Price Photography. This year (Caturday, May 26, 2018) was the 4th Edmonton International Cat Festival, and I’m happy to say the festival, which donates 100% of proceeds to local cat rescues, saw more than 2,500 attendees and raised $21,000 for the Edmonton Humane Society, Little Cats Lost, and Zoe’s Animal Rescue! 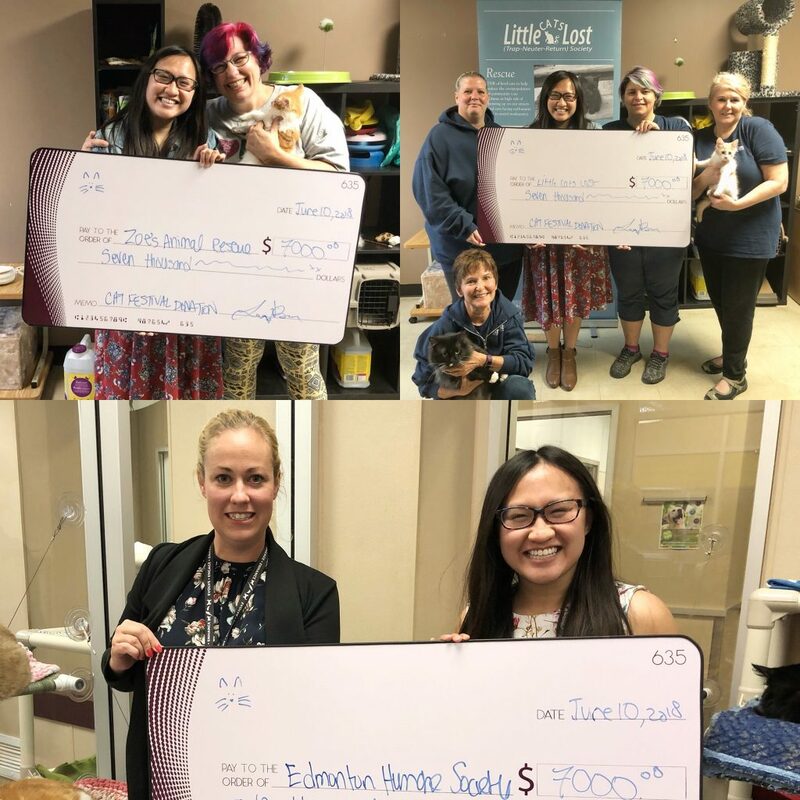 $21,000 was raised at the 2018 Edmonton International Cat Festival. This was donated between three local cat rescues. It’s vital to Give Where You Live; to support and make an impact in your community. And as a #TeamTELUS ambassador this year, I thought this was a great opportunity to share a bit more about the Edmonton International Cat Festival—the biggest way I give where I live—and highlight the some of the different ways TELUS gives back too. Disclosure: As a #TeamTELUS ambassador this year, I work with TELUS to write about the cool tech and initiatives they’re involved in. I don’t write anything I don’t agree with or believe in! TELUS Days of Giving runs May 1-June 30. A number of community initiatives take place that make a positive impact. TELUS gives where they live. Photo Credit: TELUS. TELUS has a number of charitable and community initiatives it does throughout the year, across Canada, that drives home that notion of giving where you live. One of those initiatives is TELUS Days of Giving, which runs May 1-June 30, 2018 this year, when TELUS team members, retirees friends, family, partners (volunteers), come together to do things like sorting food at food banks, donating books to libraries and schools, feeding meals to the homeless, or planting trees and plants in parks and gardens. Another way they give back is through TELUS Community Boards. There are 13 Canadian and five international TELUS Community Boards. Since 2005, these boards have supported over 5,000 charitable / community projects, donating over $64.9 Million to grassroots organizations. In Edmonton specifically, the TELUS Community Board has donated $6.8 Million to 469 grassroots projects since it started! In 2017 alone, $500,000 was donated to 38 Edmonton charities through TELUS’ Edmonton Community Board. While the festival attracts thousands of people, raises (what I think) is quite a bit of money for local cat rescues, and can at times feel like a big operation, it’s really not. It is completely volunteer-run, with a very tiny team actually putting it on—myself, with the help of primarily my husband Mike, my friends Brittney, Diane and Lisa, and then as mentioned, wonderful volunteers who are mostly just my dear friends. Without volunteers and sponsors, the festival couldn’t exist. Which would be a damn shame given the impact it makes, and the number of Edmontonians, Calgarians, Albertans, people from B.C, Saskatchewan (and maybe further), who attend. I started the Edmonton International Cat Festival back in 2014, for a few reasons. I had for a long time wanted to work on some type of event or activity for Edmonton (building on the momentum of Make Something Edmonton). I knew whatever I ended up doing or making, should give back to the community in some way. I wanted this to be a passion project. I knew it had to be something I cared deeply about in order for it to work. Edmonton is festival city! Not a weekend goes by in the summer where there isn’t a festival (or two, or three). So why shouldn’t Edmonton be home to a cat festival? Annnnd #5 is, at the time, there was a travelling cat film festival that had been announced for Canada and it wasn’t going to stop in Edmonton – which was sort of a trigger point that made me think, we don’t need someone else to create a cat event to bring to our city, we can just start our own! 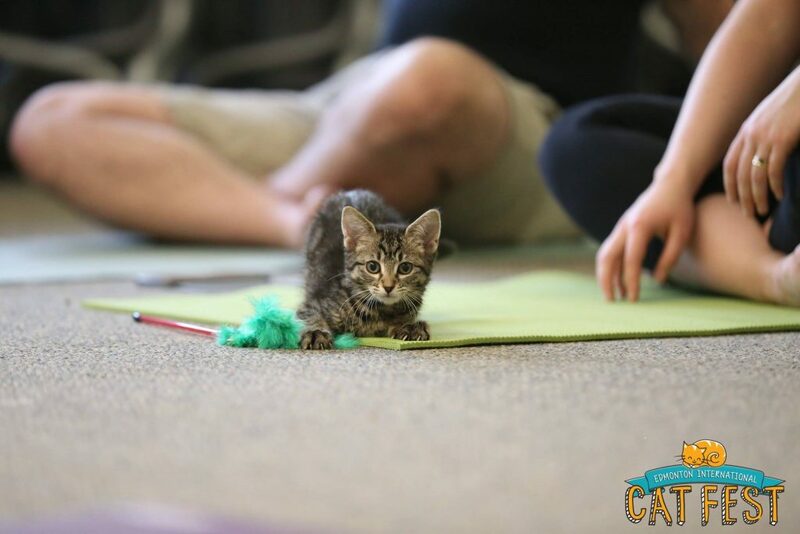 Kitty doing kitty yoga at the Edmonton International Cat Festival. It’s been incredible to see how the festival has grown over the years. Although we took a cat nap in 2017, we still came back this year with lots of momentum, a different venue, more cat-ivities than ever before, with lots of great feedback and the total amount raised for local rescues now up to $80,000. Honestly, it’s just a really good thing to do. Support your community. Make the world (or at least your little part of the world), a little better. TELUS’ hope is to inspire Canadians to give back. When you do, whether it’s through a charitable festival or just a nice, random act of kindness, share about it using the hashtag #GiveWhereWeLive! Thank you to everyone who has been involved in making the Cat Festival such a success—from the volunteers, to vendors, sponsors, attendees, and everyone in between. 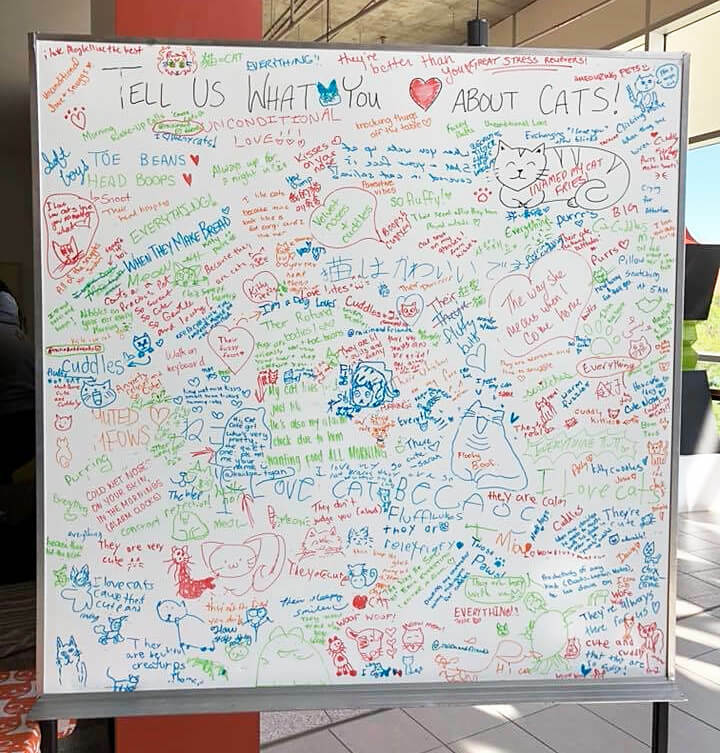 Thank you for coming together to celebrate these a-meowzing felines and our love for them, and thank you for helping us make at least a little impact in the community. I love all of these reasons why people love cats. Shared at the 2018 Edmonton Cat Festival. Disclaimer: I will always provide my 100% honest opinion on this blog. I wanted to write about my experience with the Edmonton International Cat Festival, including its charitable impact, which tied in nicely with the charitable impact of TELUS and their TELUS Days of Giving. As a #TeamTELUS brand ambassador, it made a lot of sense for me to tie in TELUS’ charitable efforts with my own. This has no impact on opinions stated in this post. I’m a huge cat lady. PrevPreviousTravel Alberta: Explore Edmonton on Wheels! (Urban Pedal Tours, River Valley Adventure Co).